Nerdtour 2012: kaze wo hikimashita… – Nerdwatch! « Nerdtour 2012: Tokyo Sky Tree – No, it’s not small! Urgh, I’m now on day 2 of a crappy head cold. It’s a little disheartening to learn the hard way that not all Japanese care enough about the people around them to cover their faces when they have a cold. In walking through crowds to and from stations, or standing on tracks in a crowd waiting for a train, I’ve seen a lot of people wearing the “surgical masks”, to keep from spreading their colds via coughing or sneezing. Unfortunately, some people in the crowds have not been so considerate, and I’ve been standing near people who let loose with a cough or sneeze, leaving their clouds of mucus and viruses for others to walk through. It’s hard to avoid them, too, when you basically have to keep moving behind them, or have to grab the hanging straps that have been grabbed by untold others. At any rate, it hit me Monday evening, the sneezing, the runny nose, the crappy feeling. Tuesday I stayed in the apartment until the evening, when I decided I needed to get some kind of cold medicine, and some food and something to drink. A quick Google search of the expat sites for advice, a little research with my iPhone dictionary app, and I was ready to head to one of the local drugstores ( 薬屋, kusuri ya, literally “medicine shop” ) for some head cold medicine ( 風邪薬, kazegusuri, cold medicine ). I wanted something specifically for the symptoms I had, sneezing ( くしゃみ, kushyami ) and runny nose ( 鼻水, hanamizu, literally “nose water” ^_^ ). Fortunately I was able to convey this to the pharmacist, who pointed me to a box of something that had most of the words, and double-checked with him to make sure. So, fortified with hope, I stopped at a combini to pick up dinner and some juice and soda. Different convenience stores stock different things, but they all have a hot food, cold food, and drinks section, so I picked up a tonkatsu meal, which is a fried pork cutlet, on scrambled egg and rice, and a bottle of Kagome vegetable juice. On the way back I passed a vending machine that carried hot and cold drinks, and so I decided to try a “hot lemonade”. Sure enough, a bottle of lemonade came out of the machine, very warm. I bought two, and they were still warm when I got back to the apartment. 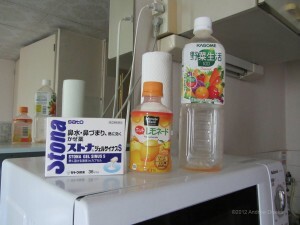 I drank the bottles of hot lemonade with the cold pills, and as I was eating the tonkatsu, the medicine started working on my cold. I called it an early night a few hours after that, but had to wake up a few times during the night with more sneezing. Today, Wednesday, I’m feeling a bit better, the cold is still with me but not as bad, and the cold pills are doing their job. I figure I should be back up and about by tomorrow. Hopefully I just caught the same cold everyone in Tokyo seems to have, so that I have immunity and don’t have to worry about it anymore. We’ll see. Here’s my magic combination that seems to be working on my cold! Tagged cold, Japan, Japan Trip, Japanese cold medicine, Japanese language, medicine, nerdtour, Nerdtour 2012, Tokyo, virus. Bookmark the permalink.